A series of powerful earthquakes which struck Asia and South America recently could be followed by a ‘mega’ quake in the near future, a scientist has claimed. Roger Bilham, a seismologist at the University of Colorado, told The Daily Express: ‘The current conditions might trigger at least four earthquakes greater than 8.0 in magnitude. The U.S. Geological Survey, an independent agency which monitors natural hazards such as earthquakes, says ‘mega’ earthquakes are rare, but not impossible. It says there is no fault line – the areas where shifting plates that make up the earth’s crusts meet – is known which is capable of generating a magnitude 10 earthquake. However, scientists cannot completely discount a ‘mega’ earthquake because they’ve only been measuring seismic activity for the past 100 years. Meanwhile, Japanese rescue teams were today scouring the splintered remains of buildings destroyed by the shakes as time ran out for finding survivors. The 7.3 magnitude tremor which struck yesterday, killing at least 32 people, injured another thousand and caused widespread damage. 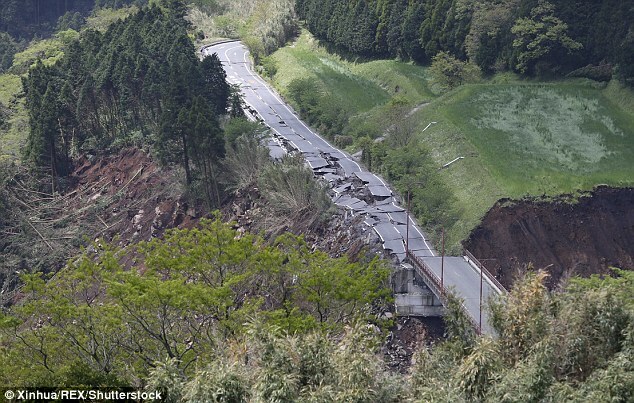 In the village of Minamiaso, 11 people were ‘out of contact’, said public broadcaster NHK. Rescuers pulled 10 students out of a collapsed university apartment in the same settlement yesterday. The country’s second earthquake hit on the same day as a powerful 7.8 magnitude shake rocked coastal Ecuador. It was the largest earthquake to hit the country for several decades and a state of emergency was declared for four of the worst-affected regions. Officials said at least 77 people were killed, over 588 injured and the damage stretched for hundreds of miles to the capital and other major cities.